The leaders (movers, shakers, and Council majority) of Ann Arbor celebrate the notion of Ann Arbor exceptionalism. This evidently extends to invulnerability in times of uncertainty. While the nation and even the world wait to see what will unfold with the Trump presidency, we are ready to bet on future Federal dollars to achieve our dream of a new train station. On June 5, 2017, City Council will be asked to pay an additional $137,026 toward the new station. (The last vote was in January, to put money into a contingency fund for this purpose.) This money is intended to allow the City to collect the last part of a planning grant for a new station. Yet, it appears unlikely that Federal funds will be available for actual construction of a station. And even more significantly, the contracted work may not be finished in time to be reimbursed under the current grant. But the project is running up against a brick wall. The grant funds expire (gone back to the Treasury) as of September 30, 2017 (end of FY 2017). 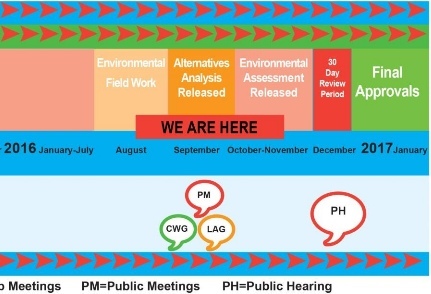 The schedule published on the City web page indicates that the required public hearing and 30 day review of public comments was to take place in December 2016, with final approval of the EA in January. But the proposal has languished in some void between the FRA and the consultants. Now it appears increasingly difficult to fit in all the tasks needed before expiration of the grant funds. That would leave the City liable for all the costs that have been incurred since this phase of the work began. FRA has expressed some concern over the City’s ability to complete the work within the grant funding period. To that end, FRA has authorized a “tapered match” approach, in which the City can access the federal funds first. Staff believes under this structure, we can advance the majority of the PE effort before the end of July. Council should note that the FRA cannot guarantee that invoices sent to them after June 30th will be processed prior to their mid‐September cut‐off for FY17 funds disbursements. An odd note is that the project is not shown in the attached schedule to be completed until October 2017. How does that reconcile with a September 30 deadline, much less a June 30 deadline? Yet presumably the City would not pay the consultants in advance of their work. (The usual approach is that consultants issue invoices as work is done, and the City sends them to the FRA for reimbursement of the grant amount.) It appears that the City is proposing to make itself responsible for completion of the work past the grant deadline. All of this seems to be very creative accounting practice. We recently alluded to the history of former Mayor John Hieftje’s vision with reference to the grant that was awarded for the first phase of planning a new train station. Like most Federal grants from those golden days, this ARRA grant of $2.8 million (from the Obama stimulus of 2009) is for 80% of the cost – in this case, for the Environmental Assessment under NEPA, and some preliminary planning and engineering. It has been the expectation that a future grant for actual construction would follow that same 80% Federal – 20% local rule. But even 20% of a multimillion dollar building is a big bite for a small city. So originally, the promise from Mayor Hieftje was that the City would put in NO GENERAL FUNDS. 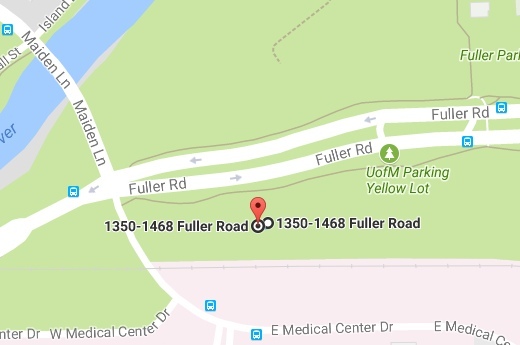 Instead, the local match was to be picked up by the University of Michigan in a joint project, the Fuller Road Station. (Here is a post in which that promise was made explicitly). That deal fell apart and UM built a parking structure elsewhere. Ann Arbor had already expended a fair amount of money on early planning, but that work was not accepted as a local match toward the grant, so the money was essentially wasted and new cash from the General Fund had to be invested in order to stay in the running for the grant. The City has now spent over $1 million just in matching funds for the grant (most of this went to consultants and planners), though much more has been spent that doesn’t apply directly to that grant now. And now it could be liable for all the sum left (about $750,000), including the 80% Federal match. Much of the uncertainty has been in the Federal budget process itself. As we explained in some detail earlier, transportation funding is complex. Part of it is based on the Highway Trust Fund – a dedicated source of revenue. The rest is dependent on the dispensation of Congress, in money from the General Fund or from new sources of revenue. Much of that was hanging by a thread until recently because all Federal funds were dependent on passage of a continuing resolution – which happily was passed on April 28 and signed by the President. Here is a summary of transportation funding under that resolution. Note that some important items, namely TIGER grants and New Starts, that were to be eliminated according to the President, were saved in this extension. The flexibility to use Federal dollars to pay for essentially local infrastructure projects has created an unhealthy dynamic in which State and local governments delay projects in the hope of receiving Federal funds. Overreliance on Federal grants and other Federal funding can create a strong disincentive for non-Federal revenue generation. Instead, the White House would move to a model in which private investors would enter into partnership with states and local governments to build or improve projects that have a revenue generation capability. So – toll roads, transit prices high enough to pay a profit, fees for using anything. The Feds would simply facilitate all this. The idea is so potent that investment funds along these lines have already attracted Saudi investors. Under the very best of scenarios, Congress will pass a budget for FY 2018, to begin October 1. All current funding will expire as of September 30. In the past few years, Congress has failed to pass a budget at all and instead has relied on a series of continuing resolutions, which generally hold most budgets where they began, with a few small changes. But let’s assume that they make it this time. (After all, one party controls both houses of Congress and the Presidency.) What are the chances that discretionary spending on transit will be included in the new budget, given the strong leanings by the White House and the tax-cutting mood of Congress? That this will somehow result in the future in a new train station. Rather high-stakes cards, and to my risk-averse eyes not a good bet. Will Council raise, or fold? As we related in the last post, Ann Arbor has been dreaming of trains for the last decade. We have paid for multiple studies, and detailed plans and reports have been produced. Our Mayor, Christopher Taylor, has named rail travel as a top priority. In a letter sent to many constituents early in January, he stated “Expanded rail service is vitally important to the future of Ann Arbor”. (Here are some further comments reported by the Ann Arbor News.) Now the City Council has just a couple of months before the next Budget is adopted. How much of the City’s resources should continue to be devoted to this purpose? After so many years with rail in the future, is it time to relegate these dreams to the past? First of all, this question is not about whether we love trains. Of course we love trains. Most of us of any age or travel experience have happy memories to relate. (I have a sentimental description of my own experiences in this post from 2011.) Trains are part of the sensibility installed in us from childhood. Here is a video of a favorite childhood song about trains. Wouldn’t you like to climb aboard on this train, or at least join in? Trains are a great mode of travel. Sit and read (or work) or just look at the scenery. No worries. Why wouldn’t we want to be able to travel to Detroit without worrying about freeway traffic and parking? And as a commute, it can’t be beat, especially if that “last mile” problem can be solved. (Transit from the station to work.) If you have visited a city with a light rail system, you know how nice it is to travel around an urban area that way. Just hop on, ride a few minutes, hop off. For all these reasons, and for several others, the dream has survived since 2006 and has been enthusiastically adopted by many on our Council, and by many citizens. The rail projects have all been studied and are ready to be implemented, more or less. But is this possible? Most of all, can we afford this vision under the present circumstances? Because consultants have been hired to do studies of our rail wish list, we have some rather good numbers now for how much these projects will cost. The costs for the Ann Arbor Train Station have been kept rather obscure through the Environmental Review process, as has much other information. A construction estimate was provided via a FOIA by Dave Askins (thanks to a direct response by Howard Lazarus, the City Administrator). A couple of feasibility studies have been completed for the Connector. The North-South Commuter Rail (aka WALLY) Feasibility Study has recently concluded; here is the Financial Analysis. The Ann Arbor-Detroit Commuter Rail was folded into the Regional Transit Authority and cost estimates were included in that plan (RMTP) . From all of these studies, we can compile a total of the full cost of the rail wish list for Ann Arbor. Note that these figures are not the amount that the City expects to pay. The Connector, WALLY, and the Ann Arbor-Detroit Commuter Rail are all expected to be cooperative projects and other governmental entities are expected to contribute. (The Ann Arbor Station is an Ann Arbor project alone.) But in every case, the expectation has been that the main burden of the cost will be borne by the Federal Government. Often the statement has been made that 80% of the cost will be Federal, and the 20% local matching amount is partly offset in theory by the State of Michigan (MDOT). Costs for these projects are of two types: Capital (original construction) and Operating (annual cost of operation and maintenance). Capital costs are a one-time investment, but operating costs are perennial. Annual operating costs for three rail projects. It is assumed that Amtrak would continue to operate the train station. These are gross costs; offsets for fares and fees not subtracted. Most City expenditures are based on fairly accurate estimates, either for existing contracts or from well-fleshed out plans. Most budgeted items will be spent as described, with a fair certainty that the deliverable will be produced. There is never quite enough money for all the things we would like to achieve as a community. The City Administrator, Howard Lazarus, has been making presentations to the Council in advance of the budget. Capital improvements are suggested for firehouses, streetlights, sidewalks, dams, and signals. The slide also showed the following amounts ($millions) for FY 2018 and FY 2019. The last column to the right is “FY 2020+”. Taken all together, the rail items constitute 43% of all capital improvements. These are General fund expenditures in the City Budget for the next couple of years. From the slide of 2018 capital improvement costs. Figures at bottom include more items than shown here. If Council is going to continue to use Ann Arbor city funds (taxes) to pursue these rail projects, it is making a calculated gamble. We are continuing to put chips on the table in hopes that there will be a big payoff. And the expectation has been that the deep pockets at the table belong to the Federal government. That is no longer true. With the Trump presidency, predictions are impossible. One can, however, hear solid hints of what he is thinking. There are other players in Federal funding, especially many different factions and interests among members of Congress. Here are a few high points about Federal transportation funding, which has usually been very contentious. The gold standard is outright grants. In other words, Federal taxes distributed directly to states and localities for use in transportation projects. This is what we would like for all our projects. There has been a move in recent years toward encouraging localities to apply for loans instead. The TIFIA program is an example. Pennies were falling from heaven in 2009, with the Obama stimulus program, better known as the American Recovery and Reinvestment Act (ARRA). This was especially friendly to transit programs and included the high speed rail program (HSIPR) program that has paid for our preliminary rail station study. It was not renewed with the new Republican Congress in 2010. All ARRA grants expire at the end of the current fiscal year (September 2017). The main source for transportation grants has been the Federal gas tax, or Highway Trust Fund. The tax rate has not increased since 1993. This fund was originally to pay for the Interstate system. A mass transit fund was added to it in 1982. The Transportation Act, which is the law that governs how the money is spent, has expired a number of times and been renewed and rewritten. This is always a big food fight in Congress. The way the money is allocated changes in each revision. There are always legislators who would like to get rid of the mass transit and alternative transportation provisions so more money can be spent on roads and bridges. Through some miracle (and our Senator Debbie Stabenow deserves a lot of credit), the Transportation Act actually got revised and renewed in the last Congress. The name always changes. The last bill was MAP-21; this one is the FAST act. An important feature of the Transportation Bill is that items funded by the Highway Trust Fund are not dependent on the Federal Budget because they are not part of the General Fund. This has kept funding of mass transit programs, for example, very stable. The FAST Act included rail travel for the first time. BUT it did not attach Highway Trust Fund monies to it. RAIL IS DEPENDENT ON ALLOCATIONS IN THE FEDERAL BUDGET (the General Fund). Congress has been keeping the Federal Government running by a series of continuing resolutions. It has not actually passed a budget for a long time. The current Continuing Resolution expires on April 28, 2017. Meanwhile, President Trump and Congress are trying to conclude negotiations on a variety of bills and spending priorities. Here is the Budget Blueprint recently published by the White House. The two most important points affecting grants to local governments for rail in the White House blueprint are the cancellation of TIGER grants and the loss of New Start funding for new projects. TIGER has been a source of discretionary grants – very competitive (only 1 in 20 grant applications funded) but very essential to localities. That is the source that Ann Arbor hoped to tap for the new train station. New Starts have been the method of choice to start a new rail system “fixed guideway program” (which includes Bus Rapid Transit); this would have been the likely source of cash for the Connector or possibly one of the commuter rail systems. Without these, there is literally no Federal grant program that could realistically pay for our rail programs. Even if Congress does not follow this blueprint, it must still appropriate funds for any grant program. With the Continuing Resolution due by April 28 and tax cuts looming on the horizon, this seems unlikely. What about the infrastructure program that President Trump has mentioned? It would not be grants, but rather tax incentives for private investment. The likely mechanism would be “P3” (Public-Private Partnerships) programs where the locality borrows money from private investors. A preliminary list of likely projects has been released, but has no force in law. Many such programs will require a source of revenue, such as fares, tolls, or fees. This is a clear call for privatized projects. What is not clear is what “impediments” are going to be cleared. Agreement by local governments? Safety regulations? Environmental hazards? Best not to picture this too fully. Since it is so unlikely that there will be Federal grants to pay for the wish list of rail projects, what should the City Council do? One alternative would be to sit tight and wait for developments. But will they spend substantial funds in the next year on these projects, with all the other priorities? To do so seems to be a triumph of hope over prudence, indeed. Perhaps there is a good lottery running somewhere. The Mayor of Ann Arbor, John Hieftje, held a convocation of area leaders on June 15, 2006, in which he outlined a broad vision of transportation for Ann Arbor and the region. As he explained (press release), the vision would bring environmental benefits (lessen air pollution), enhance quality of life, and increase the region’s economic competitiveness. The vision was named the Mayor’s Model for Mobility. Its elements were an East-West Transit (commuter rail) to link communities in Southeast Michigan, as well as a North-South Rail. 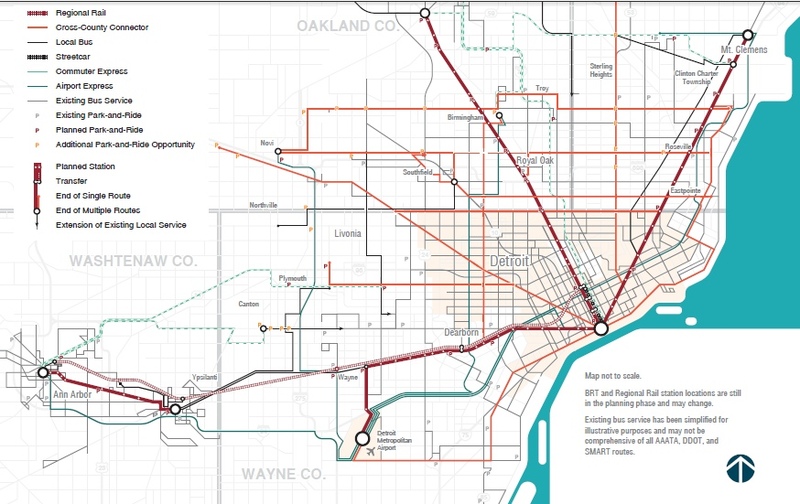 There would also be a local connector system to link up the two railroads, and a streetcar system that would encompass the many sprawling campuses of the University of Michigan. The plan was illustrated by a sketch that is positively jolly. The vision was bold and in those heady days before the economic meltdown that affected local property values (and thus local property tax revenues), it seemed not unlikely. Hieftje at that time was at the height of his influence, with a City Council that was solidly behind him. He had the power of appointment to the board of the Ann Arbor Transportation Authority, the ear of our Congressman, John Dingell, and a strong relationship with the administration of the University of Michigan. The remarkable thing is that, over a decade later and despite many discouragements, the current Mayor (Christopher Taylor) appears to be bent on fulfilling the original vision. 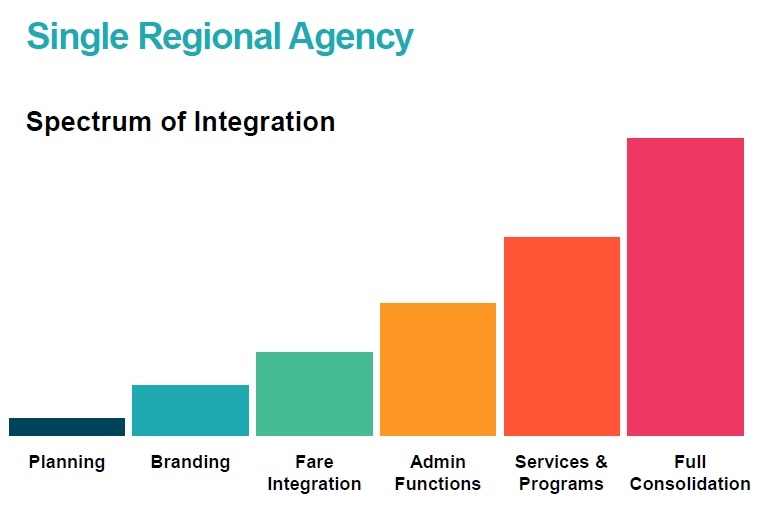 And its elements, especially those relating to rail travel, remain at the top of Ann Arbor’s priorities, as reflected by the Capital Improvements Plan. But these are extremely expensive and rely on the assumption that there will be Federal grants to pay the major portions. In light of recent changes, both in current transportation funding, and in the change of emphasis in the Presidency (as we indicated in the last post, the ground has shifted), how realistic is this vision now? And how does this affect the rest of our local government initiatives, since we are presumably setting aside considerable funds in order to accomplish these decade-old objectives? The timelines and priorities for some of the rail projects, such as the North-South rail (WALLY) and the East-West commuter rail, are more distant. But the rail station (the Ann Arbor Station) is priorities # 1,2 and 3. Also a very high priority is the Connector, a light rail system that will connect the UM campuses. While the commuter rail projects and the Connector have other possible participants, the rail station is our very own. The train station was part of a grant awarded to the State of Michigan from President Obama’s stimulus program. That program, ARRA (American Resource and Recovery Act) was launched in 2009 and the availability of the funds is ending in May 2017. Actually, the grant awarded is only to pay for the initial assessment of the site and preparation of a preliminary design and engineering review. Mayor Christopher Taylor has consistently placed the Rail Station at the top of his list in importance for Ann Arbor. In a recent article in the Ann Arbor News, he argued for its importance as he anticipates an increase in rail travel, including a new commuter rail service. As described in a second article , Taylor was able to persuade a majority of his City Council to provide funds for work that cannot yet be done. As always with government, much comes down to money. How much will it cost? Where will it come from? When will it be spent? The answers to some of these questions are in that Capital Improvement Plan mentioned earlier. Staff takes all the information given to them and assembles timelines and cost estimates. They also indicate some of the expected sources of the money. But here are some important points to keep in mind. The General Fund is the checkbook for the City’s cash flow. It is the amount of money from property tax each year. Most other funds in the budget are restricted to specific uses, such as roads from the road millage. If Council spends money on special projects, it is from the General Fund. The General Fund revenues for 2016 were $83,617,342. That’s $83.6 Million for the whole city. Now look at this information from the CIP. Note that some activities are already in process (2017). But we have some big-ticket expectations, in a relatively short time. Amounts from the FY 2016-2021 Capital Investment Plan. WALLY omitted. According to this, we’ll be building a train station in the next fiscal year (begins in July 2017) And we’ll put more than 10% of the General Fund into this one project. I don’t believe it either. And there are other details. The remainder of that $44.5 million is supposed to come from a Federal grant. (Money has not been allocated.) And I’m guessing that part of our General Fund amount is hoped to come from the State of Michigan. AAATA is being tasked with a grant for some of the Connector expenses, but they have a hard time making all their current expenses. 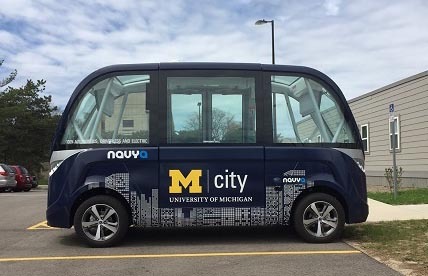 The University of Michigan, on the other hand, has committed to major expenditures for the Connector, but this is not shown here. Still, the mere scale of these commitments is breathtaking. In the next post, more details about transportation funding as it might affect this project. But meanwhile, all this is hard to take in. Will we really rearrange our city priorities to accommodate this heavy a drain? Are the uncertainties being considered? How will it affect the budget (that has to take in all other City considerations) that is under preparation? How much will this vision affect our reality? UPDATE: At the February 13, 2017 Council Working Session, the City Administrator, Howard Lazarus, presented a slide showing new projections for the CIP. It indicates $500,000 for the Ann Arbor Station for FY 2018 and $13 Million for FY 2019, with the cryptic notation, “New revenue or financing”. For the Connector, it shows $600,000 for FY 2019, with nothing for FY 2018. For FY 2020 and beyond, we now see $10 Million for the City alone, with the funding noted as “tbd”. 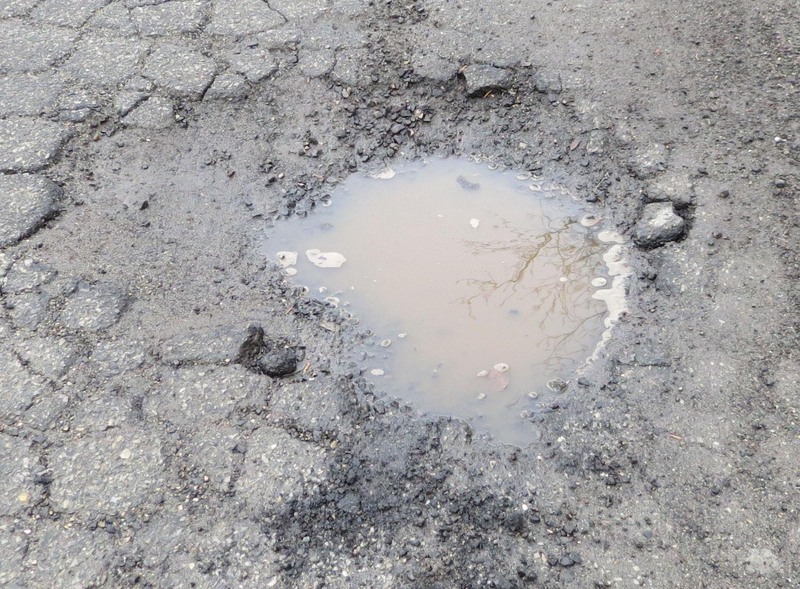 What do potholes have to do with a local transit millage? More than you might have thought. Underlying the discussion of a new millage to expand our local transit system is the general frustration of the public at large with Michigan’s transportation system, most specifically the condition of the roads. Almost every political discussion now ends with a public cry: What about the potholes? The liberal political group MoveOn.Org, usually concerned with social issues, has a petition asking state lawmakers to fix the potholes. The Michigan Democratic Party is even trying to make this a campaign issue with a Snyderholes website. This political message encapsulates the transportation issue: everyone agrees that it is a huge problem, and also that someone else ought to pay for it. Note that the suggestion is that business taxes, rather than gas taxes, should be fixing our crumbling infrastructure. Transportation funding is complex and always contentious. But it is important to understand it if one wishes to make any prescriptions for change. See our posts on Transit, Transportation and the Money Question (all available from the Transportation Page). See especially the post on the Comprehensive Transportation Fund as it pertains to transit, and the post explaining Act 51. Understanding these two pillars of transportation funding in Michigan is key to understanding the fix we find ourselves in. Transportation has become a zero sum game in that multiple constituencies are chasing fewer and fewer dollars for deeply felt needs. A central problem in Michigan is that the main source of transportation funding (the state gas tax) is less and less adequate to pay for the increasing needs in infrastructure and service. Highway Trust Fund ticker. 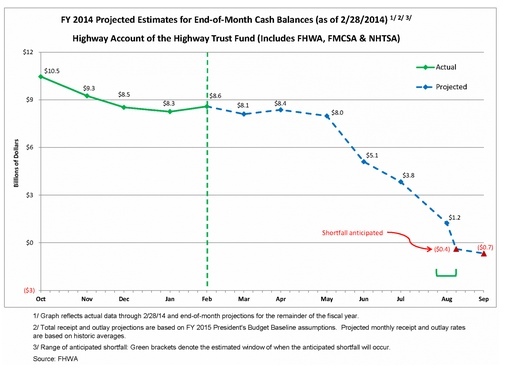 Goes into deficit before end of FY2014. A tax on gasoline is intended to be a user tax in which users of roads pay for them. It has been the principal means of paying for most forms of transportation. In the Federal Government, the (Federal) gas tax is the basis of what is called the Highway Trust Fund. That fund is regulated by the transportation act, currently MAP-21 (expires in September 2014). Here is SEMCOG’s summary of MAP-21. MAP-21 is the source of most highway and transit funds that come through to Michigan communities via the Michigan Department of Transportation. An important thing to know about the Highway Trust Fund is that it essentially funds an entitlement, since funds are distributed according to the formula set up by the current transportation bill. For example, Federal support for transit projects is distributed by formula rather than by earmarks or other special treatment. But since this revenue source is actually trending toward zero, transportation needs nationally look rather desperate. Here is an analysis by Transportation for America, a nonprofit interest group. Certainly there is no room there for helping Michigan solve its problems. So, returning to Michigan: a logical solution to insufficient funds would be to raise the gas tax rate, or to add some other form of tax to it. Last year, Governor Snyder’s budget message proposed an ambitious program of a new way of computing gasoline and diesel taxes plus new registration taxes. He also proposed a local option that would allow counties to have a separate registration fee to help pay for local transportation. In our tax-aversive state, this was (as we say in government circles) dead on arrival. Instead, the Legislature allocated modest sums from the general fund in a supplemental appropriation to patch up a couple of major problems (one of which was the money needed to keep Amtrak’s Wolverine line running). Sec. 702. Transportation. Requires the funds appropriated for special winter road maintenance to be distributed to the State Trunkline Fund, county road commissions, and cities and villages, in the same percentages described in Public Act 51 of 1951, and requires distribution to each entity in amounts proportional to the current year amounts distributed from the Michigan Transportation Fund. Also requires that special winter road maintenance funds be used only for road maintenance, excluding administrative, overhead, and other indirect costs. The Washtenaw County Board of Commissioners, which includes several commissioners representing rural townships, have been wrestling with the lack of adequate funding for the Washtenaw County Road Commission (WCRC) for many months. While Ann Arbor and other cities and villages in the County have their own allocation (21.8%) from Act 51 funds, the rural roads are entrusted to the Road Commission, an appointed body. They use their own allocation (39.1%) to address all maintenance problems and some of the improvements for rural roads. The news is not good. As the Ann Arbor News reported, county (i.e., rural) roads are in really bad shape, both from years of “deferred maintenance” and because of the rough winter. The Ann Arbor Chronicle has reported substantively on the efforts of the BOC to address a problem for which they do not really have jurisdiction (the WCRC has a completely separate administration and governing board; the commission members are appointed by the BOC, but it has no influence over day-to-day decisions). The BOC has kicked around ideas about absorbing the Road Commission into their own body (in essence, becoming the WCRC) and appointed a subcommittee to look into that possibility, as well as expanding the size of the WCRC and making it an elective body. According to a report by the Ann Arbor Chronicle of their March 1, 2014 meeting, it appears that none of those options will be exercised. A possibility that appears still to be alive is that the BOC would use a pre-Headlee Act 283 (P.A. 283 of 1909) to levy a millage on all the county for roads. The discussion, as reported by the Chronicle, seemed to veer between the idea that Ann Arbor and other cities would be allocated parts of this and that use of the funds would be decided by the WCRC. Unlike post-Headlee legislation, this tax could be enacted without a vote of the public. Township representatives at the BOC meeting were enthusiastic about this, given support by Conan Smith (an Ann Arbor Commissioner). But Commissioner Dan Smith was instead suggesting a county-wide road millage to be approved by the voters. The problem is that most cities and villages already levy special taxes on their residents to pay for their own road maintenance. For example, Ann Arbor voters have consistently renewed a local road millage. For 2013, it was 2.125 mills. We come back to the issues of governance and equity. Who should pay and who benefits? The discussion at the BOC elucidated those nicely. Commissioner Conan Smith explained the political problems entailed. He is a regionalist and favors having Ann Arbor taxpayers help to pay for rural Washtenaw County roads. But should Ann Arbor residents help to pay for roads in areas outside the city, especially if they have no say in how those additional funds are spent? Apparently much of Conan Smith’s interest in this was in bringing the function of the WCRC into the BOC. In the end, he was the only vote in favor of that option. There was evidently no discussion of when a countywide roads millage would either be imposed or voted on, or the rate of that millage. Presumably the commissioners are aware of potential overlap with the urban core transit millage. There’s an opportunity right now because the potholes are creating focus. “We should never let a crisis go unused,” he quipped. Harder agreed with Cooper, but said that some of the MPTA members get a little antsy and concerned when everything they read in the newspaper is about potholes. But that is what drives the message statewide. And if that is what they have to use to get more funding for public transportation, then Harder was OK with that –as long as they don’t lose sight of the big picture. This moved Larry Krieg to suggest a slogan for the AAATA, “You are one pothole away from public transit”. Presumably this was meant to say that your auto might be disabled so that you would be dependent on transit. A reason to vote for the transit millage? CEO Michael Ford, who receives a comfortable automobile allowance from the AAATA, supported this concept by sharing that “he’d had an incident with a pothole this week and found himself taking the bus. “It’s nice to have that option,” he said. UPDATE: Evidently the transit-charm-against-misfortune theme is not restricted to AAATA. 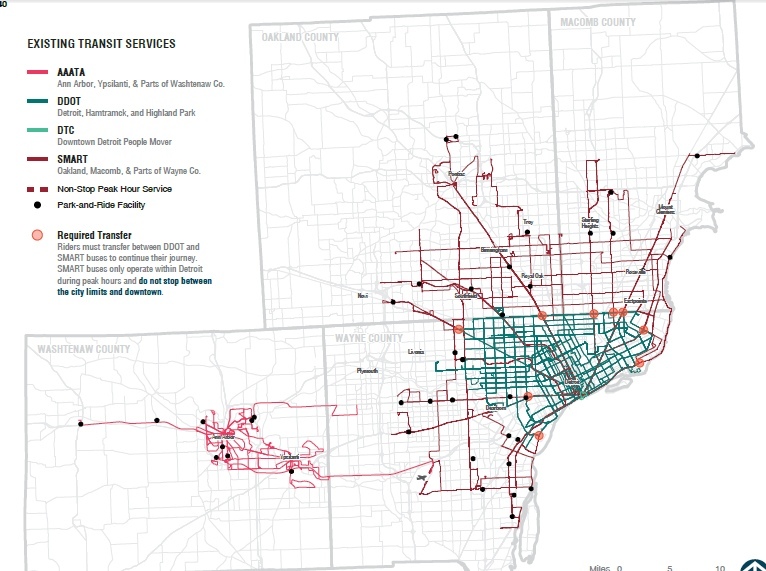 Suburban Detroit’s SMART bus system is coming up for an increased transit millage vote. Megan Owens of Transit Riders United says “Any one of us is one broken leg or one bad pothole away from public transit.” Ouch. That happened to me. But my own bus route 13 wouldn’t take me to evening meetings – it quits too early. SECOND UPDATE: MDOT has announced the amounts awarded to each municipality from the special appropriation. Here is the list of awards to counties, cities and villages the list of Michigan counties, cities and villages with their award amounts. Washtenaw County (i.e., the Road Commission) will receive $1,091,502.29 and Ann Arbor will have $461,171.49. I suspect that the potholes will consume those funds rather handily. THIRD UPDATE: A proposal has surfaced to rework Michigan’s fuel taxes. Whether it would actually increase money going to roads is questionable, and it is also not clear what effect it would have on transit funding. Here are a few details as reported by MLive. FOURTH UPDATE: A commenter on a recent Ann Arbor News report about transit millage supporters and opponents seems to suggest that I am the source of the anonymous flyer linked to in the report. 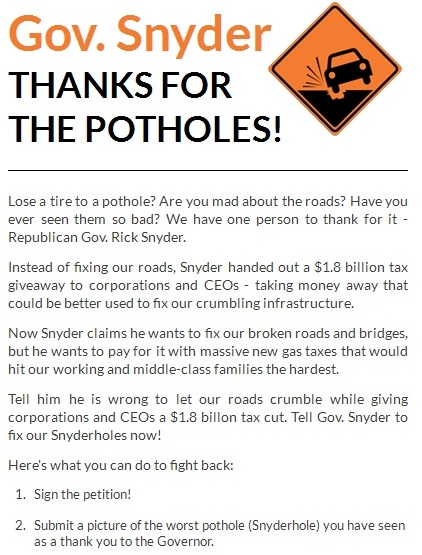 While that flyer does reference potholes, it is a rather crude and questionable statement that buses cause potholes. I don’t support that thesis (haven’t bothered to do their math), am not in the habit of putting out anonymous flyers (I sign my own blog and Twitter account), and emphatically reject any part in preparing or distributing that flyer. In making some inquiries, I have been told that the flyer was distributed by email among a group of friends. It is too bad that the Ann Arbor News chose to publish it. FIFTH UPDATE: The Legislature is moving to assign the $115 million in “priority road projects”. Expectations (as reported in the Detroit Free Press) are that the assignments will mirror the process from last year, in which almost all projects were assigned to districts represented by Republicans. Here is the list of such projects from 2013. Washtenaw County is noticeably missing from the list. We are completely represented by Democrats. SIXTH UPDATE: Trans4M (Transportation for Michigan) has a post discussing House Speaker Bolger’s proposal for altering the transportation formula. It is a concern because it would bypass the Comprehensive Transportation Fund. 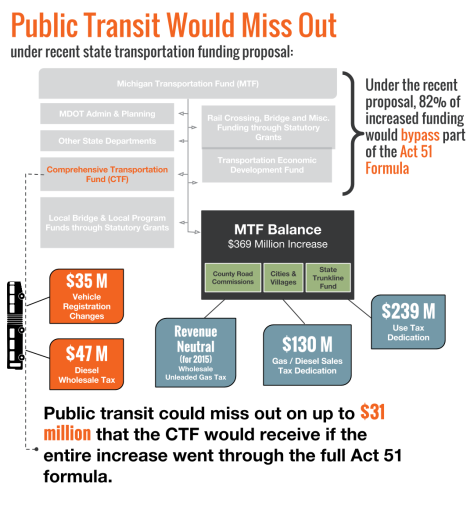 The CTF is the source of much transit funding in Michigan. The obvious intent is to emphasize roads even more. SEVENTH UPDATE: Board of Commissioners chair Yousef Rabhi has confirmed that the May 7 BOC agenda will include discussion of road funding and setting of a public hearing. The agenda will not be available until May 2. Informal communications indicate that the BOC would set a public hearing for May 21, either for the option to place a millage on the ballot, or for the option to impose a countywide millage via Act 283. The attractive thing about the Act 283 option is that the money could be available immediately, with the July tax bill, assuming that this item passes on May 21 and the subsequent meeting. (The BOC customarily votes on such items at Ways & Means after a public hearing, then at the Board meeting two weeks later.) Cmr. Rabhi has informed us that this use of Act 283 is likely not feasible, on the advice of counsel. May 7 agenda merely lists a discussion of “options for road funding”. Depending on that discussion, a future public hearing could be set for a ballot measure. EIGHTH UPDATE: Federal funding could take a real hit if the MAP-21 Federal Transportation Bill is not renewed by Congress. It expires at the end of this fiscal year (October 1). Here is an overview from Transportation for America. The Ann Arbor urbanized area alone could lose $11.8 million in transportation (including transit) funding. NINTH UPDATE: Here is an excellent, if belated, report of the April 17 Board of Commissioners working session on road funding from the Ann Arbor Chronicle. TENTH UPDATE: The AAATA transit millage ballot issue was a resounding success. Here are the numbers from the Ann Arbor Chronicle. ELEVENTH UPDATE: Regardless of the information about legality of using Act 283 for a countywide road funding millage (see the SEVENTH UPDATE), the BOC has set a public hearing for May 21, 2014 on possible use of Act 283 for this purpose. The brief report by the Ann Arbor Chronicle makes it clear that the BOC is not settled among themselves on this issue. TWELFTH UPDATE: A new report pushes the idea of a mileage-based road funding tax. A report in the Detroit Free Press describes it. The actual SMART Mileage Fee Study is here. In my opinion, this “road user fee” is a really bad idea from the viewpoint of global warming (it would penalize users of low gas mileage cars). My guess as to why the Michigan Environmental Council is pushing it is that they are hoping for increased funding of transit. THIRTEENTH UPDATE: It looks as though attempts to find new revenue for transportation funding in the Michigan Legislature are dead for the current session. According to Mlive, putting a sales tax increase on the ballot was rejected, as was an increase in fuel taxes. Senate Democrats attempted to link the fuel tax increase to a low-income tax break, which probably didn’t help. Here is an additional update from Crain’s. FOURTEENTH UPDATE: MDOT has now released the list of special “ priority projects” to be funded by the supplemental legislation. Looks as though the major Washtenaw County allocation was to Prospect Road in Ypsilanti. That beats last year, when our county got none of the special money (we are represented by Democrats). FIFTEENTH UPDATE: The Washtenaw County Board of Commissioners has now appointed a road funding committee. Here is the report from the Ann Arbor Chronicle. SIXTEENTH UPDATE: On July 31, 2014, the U.S. Senate did a last-minute save on the Highway Trust Fund, passing a House bill that barely extends the funding till next spring. It is a very short-time fix for several reasons, including the means of funding, which were a temporary adjustment in the way pension payments are shown in tax filings (“pension smoothing”). There is no long-term solution to HTF underfunding. The main transportation bill, MAP-21, expires at the end of September. SEVENTEENTH UPDATE: President Obama has now signed the temporary HTF save bill. (Maybe that syntax is ugly, but so was the bill.) Here is an overview from Transportation for America. EIGHTEENTH UPDATE: The Washtenaw County Board of Commissioners is moving toward a one-year tax under Act 283 after all. A public hearing is scheduled for October 1, 2014, after which the BOC will likely vote on the tax. With a May millage vote scheduled, the question of whether Ann Arbor and its immediate neighbors really want an expanded transit system should finally be resolved. 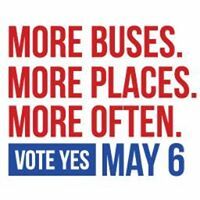 At last the board of the Ann Arbor Area Transportation Authority have voted (after a good deal of hesitation) to put a measure on the ballot which will ask the public to endorse their vision of an expanded transit system. The board of (then) AATA had a “straw vote” (nonbinding) in May 2008 to become a regional authority, rather than one centered in Ann Arbor. In November 2009, the board t00k a formal vote to move toward becoming a countywide system and began calling in the experts to figure out how. That effort was an embarrassing failure, as we have documented in our Topsy Turvy Transit series. In a recovery move, AATA launched a campaign to establish a smaller Urban Core regional authority. They encountered some of the same barriers (regional and township politics, limitations of the Michigan governance system) and were not able to persuade even all of this smaller number of targeted municipalities to join them. The limits of the expanded authority. 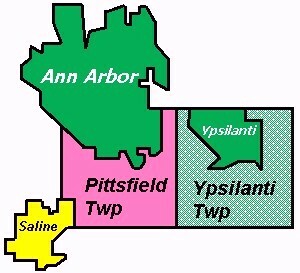 Pittsfield and Saline are not authority members. The campaign has already begun. AAATA, as a public body, is not legally entitled to campaign for passage of the millage, but has an “information” page that pushes beyond simple facts into persuasive language. A campaign by a coalition supporting the millage called “More Buses” is already soliciting contributions (it is largely fueled by Partners for Transit via the Ecology Center). And now an opposition group is registered as Better Transit Now (their website is not yet active). The Ann Arbor News has covered the contest with quotes from the participants. Regardless of the outcome, this ballot issue should help to resolve the direction that AAATA will take in the future. If the millage passes, the organization will likely continue to seek expanded regional initiatives (already they are contemplating additional “express” buses, including one to Belleville). If the ballot fails, it should at the minimum be a moment for some serious soul-searching. UPDATE: The Ann Arbor Chronicle now has an article describing the AAATA meeting at which the vote establishing the ballot issue was taken. They just refuse the truth and, instead, produce false information, stirring up fear. People involved in this anti-millage campaign complain that Ann Arbor is subsidizing services for Ypsilanti and Ypsilanti Township. This just isn’t true. Each individual community would, under this newly proposed plan, be paying for the services they would receive in the five-year plan. Actually, the City of Ypsilanti is even now being subsidized by taxpayers in the City of Ann Arbor. The millage currently being collected from Ypsi City no longer is adequate to pay for their basic service, let alone the expanded service currently being provided. The additional revenue from the 0.7 mills in the ballot measure would only be about $202, 700, which might just pay for current service but not much more. What Ypsilanti Township expects to do is to move its current POSA costs to the millage collected by the authority. 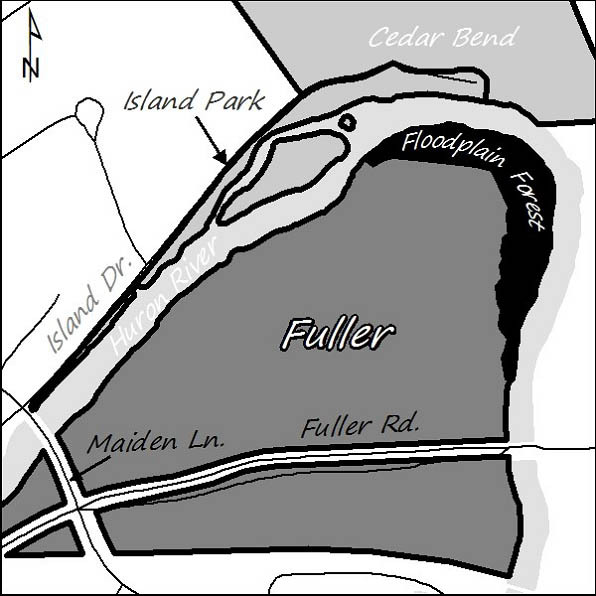 Strictly speaking, Ypsi Township will not be paying anything at all as a community. While Ypsi City’s taxpayers will continue to pay their current millage of just under 1 mill in addition to the new millage, Ypsi Township will simply offload its current general fund expenditure onto the new millage, and then ask for more service. Here is the final text of the Ypsilanti Township funding agreement with the AAATA. 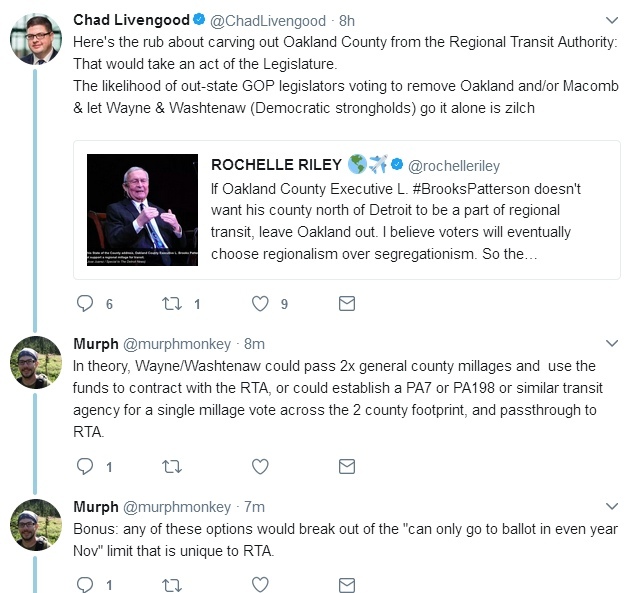 Fortunately, Maynard also includes policy wonk Richard Murphy (“Murph”), who makes a number of useful observations about route planning (hub-and-spoke emerging into a “spiderweb”). Interestingly, Maynard’s guests draw comparisons to the failed AADL bond issue, saying that “the same people” are behind the opposition to the transit issue. Actually, the only person that the two campaigns really have in common is Kathy Griswold. But it sounds better to make the opposition into a tax-hating cabal. THIRD UPDATE: The history of the campaign against the AADL bond measure, which was on the November 6, 2012 ballot, seems to have become relevant to this transit millage issue. Here is a report by the Ann Arbor Chronicle listing the three campaign committees that formed to oppose the measure. They were Love Our Library (Sheila Rice, treasurer), Save the Ann Arbor Library (Douglas Jewett, treasurer) and Protect Our Libraries (Kathy Griswold, treasurer). Protect Our Libraries was probably the most muscular effort. Here is a contemporaneous story about the campaign that shows some of the advertising. The measure was defeated rather decisively (55.17% No, vs. 44.83% Yes). (Here is the report by the Ann Arbor Chronicle.) It wasn’t supposed to happen. All the right people and the big money got behind the AADL bond and expansion. Now that the transit millage campaign is being promoted in a similar way – lots of support from organizations and community leaders, confident media campaign, a puppy-love kind of subject (though buses perhaps less cuddly than libraries) – there seems to be some concern that an upstart group could once again deal a killing blow. My take is that the library campaign was less the issue than that the community just didn’t buy it, or at least not enough voters did. I think this millage vote is likely to rest on just such a question: is this what we want for our community? The discussion won’t be over for some weeks. FOURTH UPDATE: The AAATA has now published a “report” that is a further marketing piece for the millage. It has a number of “facts” that will need to be examined closely. Some of them come from older general reports (state or national). As an example, it claims that there will be a 15% reduction in drunk driving for each additional hour of evening service. This “fact” references a Cornell University study conducted in 2008 that examined the effect in the Washington D.C. area of service via the Metro. A preliminary draft of the study shows some meticulous protocols and data-gathering. For example, the estimates of the amount of drunk driving are based in part on DUI arrests. They also study the effect of placement of bars vs. Metro stations, and identify at which bar a particular DUI originated. As you might expect, a location effect exists. Bars located more than a 5 minute walk from Metro stations showed less reduction in DUIs than those located within a 5 minute walk. Now, intuitively, if public transit is available and drunks are either smart enough or encouraged by friends to take transit, it will indeed cut drunken driving. But what kind of numbers are we likely to see in a highly dispersed rural area? What is the location of most bars in regard to transit stops? Where are our drunks coming from? (Let’s just exclude all our campus drinkers from the question – many of them presumably walk home.) I don’t think a census has been performed, thus this is not a “fact” as far as the Ann Arbor area goes, just a nicely intuitive suggestion. I’m sorry to say that this approach to data and presentation of facts seems to be rather typical of the AAATA’s marketing approach. It shouldn’t be necessary to get down in the weeds and check every number, but I guess it will have to be done. 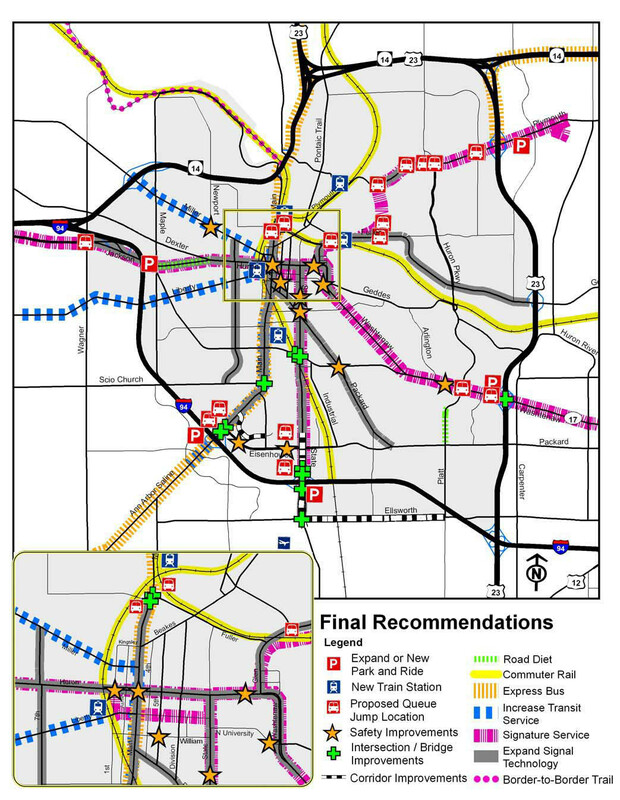 FIFTH UPDATE: The Ann Arbor News has published a twin set of reports on the transit millage. The first describes the objections that Ted Annis, a former treasurer for the AATA, has about the millage. This article refers to a number of datasets about AAATA budgets and performance. The second is primarily about salaries paid to AAATA officials. Part of the interest in the two articles are the comments. While some of them are the usual trolls, there is some serious discussion about such issues as efficiency, fares, the University of Michigan’s arrangements with the AAATA, and resistance to additional taxes. The AAATA can now place the orders for those buses. The July tax bill will include the new millage and preliminary plans for implementation begin as soon as August. The 5-year plan is detailed on the AAATA website. Some elements of the plan require assent by communities not in the Authority, notably Pittsfield Township and Saline, to contract with AAATA for increased service. That will bear watching. EIGHTH UPDATE: According to a report in the Ann Arbor News, Pittsfield Township has now (as of late October 2014) agreed to an expanded POSA that will increase bus service to the township. I have not reviewed it to determine whether this will provide the full extent of service envisioned in the Urban Core plan.